Benefitting refugees through "Cittadini del Mondo"
Books! Games! Crafts! Toys! Funds go to Cittadini del Mondo, a micro-charity in Rome that assists thousands of refugees, providing health care, legal help, language education, job training, and prenatal care. They also run an intercultural library, providing literature and children's books refugees' native languages, to offer everyone the basic human pleasure of reading and learning, and to restore some cultural continuity to people who have been completely cut off from home. As founder Dr. Donatella D'Angelo put it: "Offering people aid isn't enough; first they need to trust you enough to believe you will actually help them. Our intercultural library achieves that, by making people feel welcome and showing we have a basic respect for their humanity. Once people feel that you, then they become willing to accept medical and other aid." 1) Bid on our fun items--the funds will go directly to Cittadini del Mondo. 2) Donate an item for our auction. All sorts of donations are welcome, from books and crafts to toys and cookies! Custom services such as tutoring, expert consultation, or promising a custom poem or a custom knitted item are also usually huge hits! To donate an item contact Jo Walton (bluejo at gmail dot com). 3) Donate money directly through the PayPal button at the bottom of the page (scroll all the way down past the auction info). 4) Donate books in refugees' languages. The intercultural library accepts books in all languages, focusing on those commonly spoken by refugees from Africa, the Middle East, and East Asia. Literature and children's books preferred--fantasy and science fiction welcome! 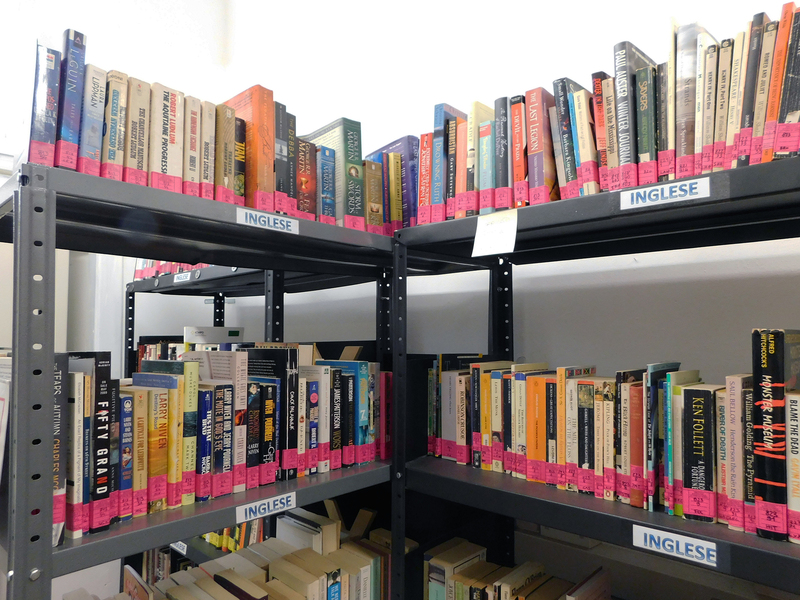 They are particularly seeking books in Chinese, Arabic, Bengali, Urdu, Ethiopian, Hindi, and French, as well as Spanish, Korean, Turkish, and Portuguese, but all languages (including English) are welcome. 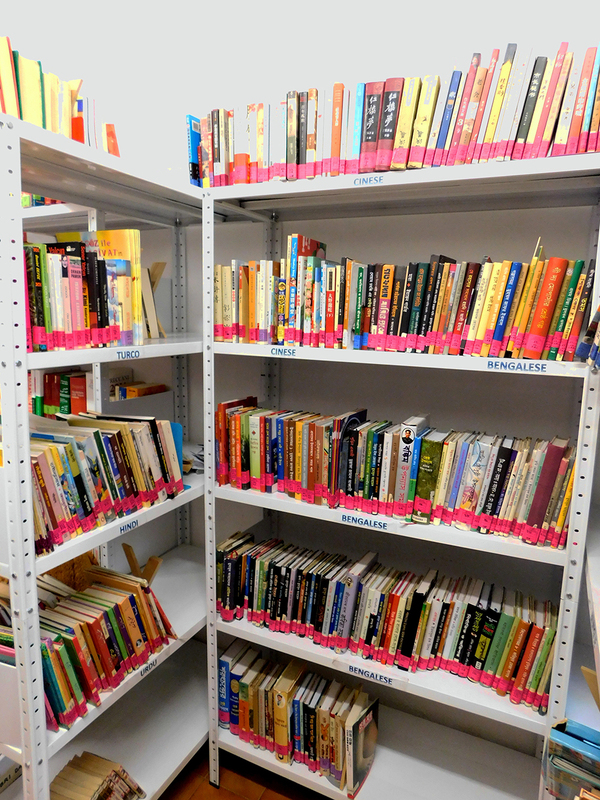 If you want to donate books for the library contact Jo Walton (bluejo at gmail dot com). CanSMOF, the 2009 Worldcon committee, has volunteered to donate $500 to cover the cost of shipping donated books to Rome, so if you have books to donate we are poised to speed them off to the library shelves! Vericon is a student-run science fiction and fantasy convention run by HRSFA, the Harvard Radcliffe Science Fiction Society. This year the Vericon convention is taking a hiatus, but we are still holding our signature charity auction. Auction items traditionally include autographed books, craft items, toys and games, merchandising for fantasy and science fiction series, art, exotic foods, and many other goodies. There will be an online auction, hosted here on BiddingOwl, where anyone can donate items and bid on items. Everyone who wants to support the community is welcome to bid on items online here, and to attend the live auction. You do not need to be a member of HRSFA. HRSFA and the organizers reserve the right to decline bids or exclude troublesome individuals from the live auction if necessary. For online bidding, you will need to make an account on BiddingOwl, then return to this page to look at items. Items that hit 5x their market value will go to live auction. If you win an item in the online auction, the organizers will contact you for mailing or collection information. In the case of declined cards, the next highest bidder will be considered to have won and be contacted. The items that go to live auction can be won even by those who will not be in Boston on the 12th. You can participate in the live event remotely by calling in to the auction by phone. If you want to do this, email hrsfaevents at gmail dot com before 17.00 EST (5pm in Harvard) February 11th to ask for the numbers. If you want to donate items, please send a photo, brief description, estimated value, and sugested starting bid our donation coordinator Jo Walton (bluejo at gmail dot com). Good luck, and please bid! This tiny but heroic team of Roman volunteers cares for the thousands of refugees who arrive by boat in Italy. People who flee on precarious fishing boats to peaceful Italy are then officially outside "crisis areas" and thus not eligible for most refugee aid, but are left with no homes, no livelihood, no access to medical services, often not even a common language to let people ask for help. Cittadini del Mondo cares for this population, providing shelter, welcome kits with clothes and toiletries, medical services, prenatal care, food and nutrition, legal help with documentation and aid applications, language training, job preparation, and library access. Cittadini del Mondo is a tiny team, and we are their first international donors. This is the third year that Vericon has supported them, and we are proud of the changes our teamwork has made possible. Last year was a particularly bad year for refugees, with the situation in Syria, and when there's a crisis like that the normal flow of refugees from elsewhere doesn't slow down, so Italy has been more overwhelmed with people than ever, coming in from more than a dozen countries. 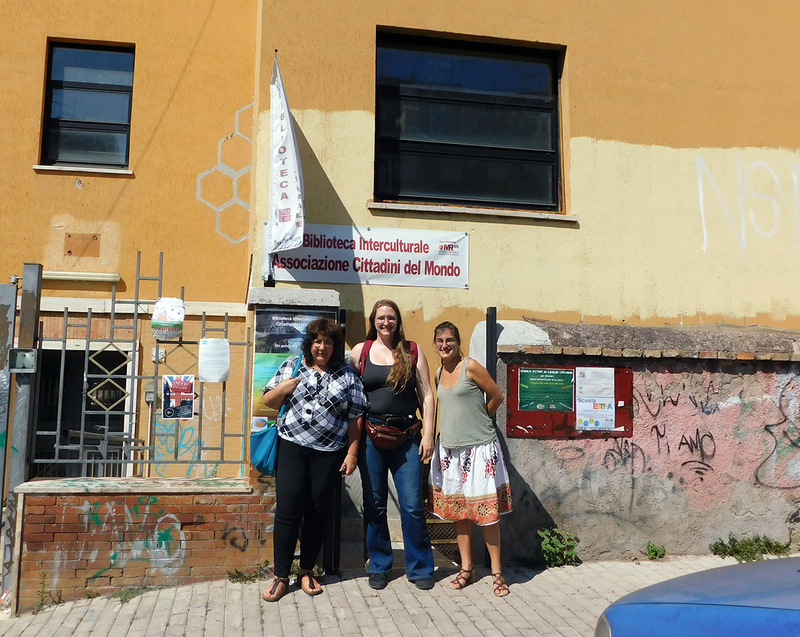 One of our auction organizers, Ada Palmer, was fortunate enough to visit Cittadini del Mondo when she was in Rome last summer, and met two of their doctors and some of their library volunteers. The library already serves hundreds of refugee families. They try to have books in the languages of all their refugees, because they understand how important it is for people far from home to keep contact with their familiar language and culture, even as they're struggling to adapt to a new one. They try especially hard to have children's books in the home languages. English is a second language for a lot of the refugees, so books in English are always also useful. If you look at the English shelves here, you can see some familiar books like A Game of Thrones and Harry Potter. 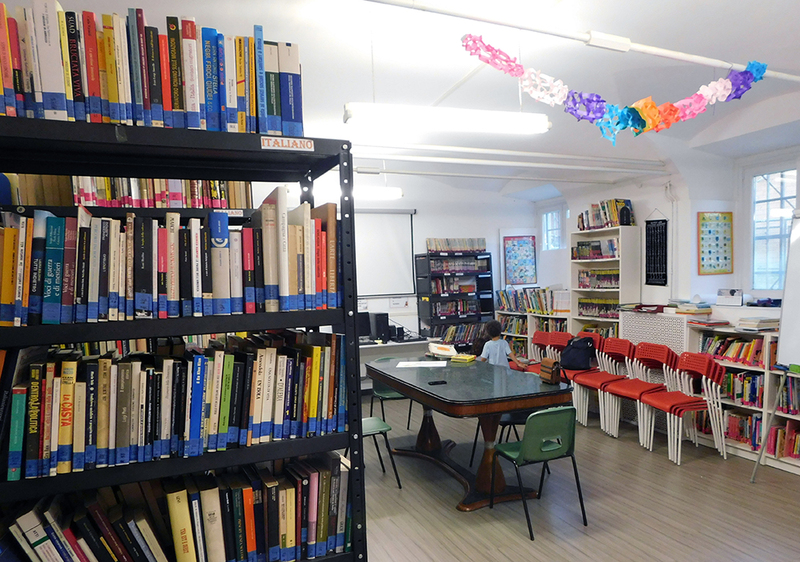 They also teach Italian classes in the library, which are very popular, both mixed classes and classes especially for women, who are often shy in mixed groups. They hope this year to expand the library. 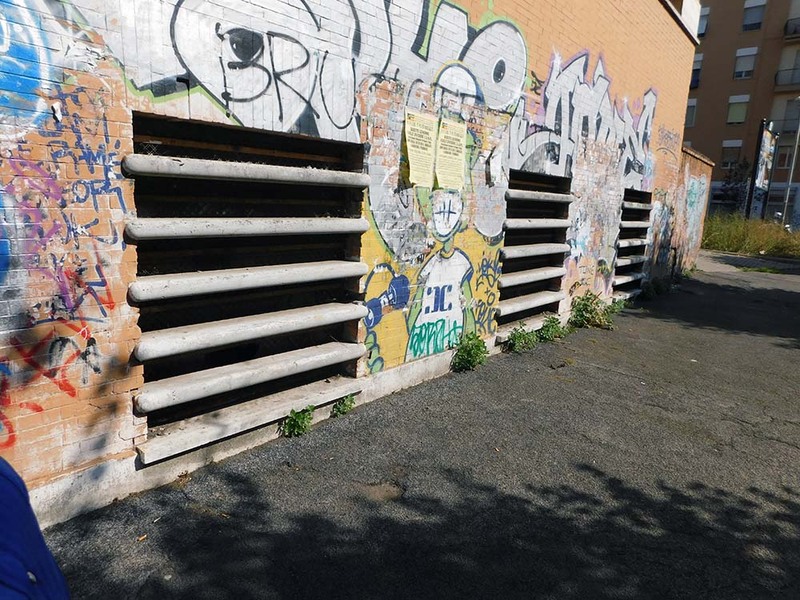 It's in a basement spece under a primary school, and they have permission to expand into the rest of the basement. It is extremely run down, with shattered windows, cracked concrete, blocked stairways, leaks and accumulated mud. It will be a huge job to restore, but they plan to do it mostly themselves with volunteer help. The financial help Vericon has given them over the last two years has made a huge difference, so that they are now starting new projects, such as providing welcome kits for new arrivals, and expanding the library, instead of just desperately trying to stay afloat. Here you see one of their new arrival kits: shoes, towel, personal hygiene materials, clean new underwear, a backpack for personal possessions--one set is waiting for every new arrival now, thanks to our teamwork! The last two years of Vericon's partnership with Cittadini del Mondo have been incredible. With our books and yarn and toys and recipes, and the energy of our enthusiasm for imaginary worlds and for this one, we gave more than 8,000 people access to medical care, legal help and basic necessities in their dark and desperate hour. Last fall the Cittadini del Mondo team wrote to us of their excitement having the donation because "Winter is coming and we definitely need more drugs for flu and colds." Well, winter came, and, thanks to our efforts, the team was ready to meet it head on, and triumph. In the next year the Cittadini del Mondo team hopes to take on their most ambitious challenge yet: the completion of their expanded library. We are proud to partner with their efforts, so thank YOU for helping! Use the button below to donate directly to our fundraising efforts. Your donation will go entirely to Cittadini del Mondo.